When Hugh Deveraux discovers his newly inherited earldom is bankrupt, he sets about rebuilding the family fortune—in the gaming hells of London. But the most daring wager he takes isn’t at cards. A wealthy tradesman makes a tantalizing offer: marry the man’s spinster daughter and Hugh’s debts will be paid and his fortune made. The only catch is that she must never know about their agreement . . .
Heiress Eliza Cross has given up hope of marriage until she meets the impossibly handsome Earl of Hastings, her father’s new business partner. 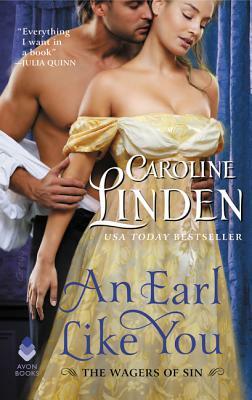 The earl is everything a gentleman should be, and is boldly attentive to her. It doesn’t take long for Eliza to lose her heart and marry him. But when Eliza discovers that there is more to the man she loves—and to her marriage—her trust is shattered. And it will take all of Hugh’s power to prove that now his words of love are real . . .
Caroline Linden knew from an early age she was a reader, not a writer. She earned a math degree from Harvard University and wrote computer code before turning to fiction. Her books have won the Daphne du Maurier Award, the NJRW Golden Leaf Award, and RWA’s RITA® Award, and have been translated into seventeen languages around the world. She lives in New England with her family. Find her online at www.CarolineLinden.com.